Before Sasha came into my life, I already had a reasonable collection of dog-related reference works in my office—about what you’d expect for anyone writing fiction involving dogs. 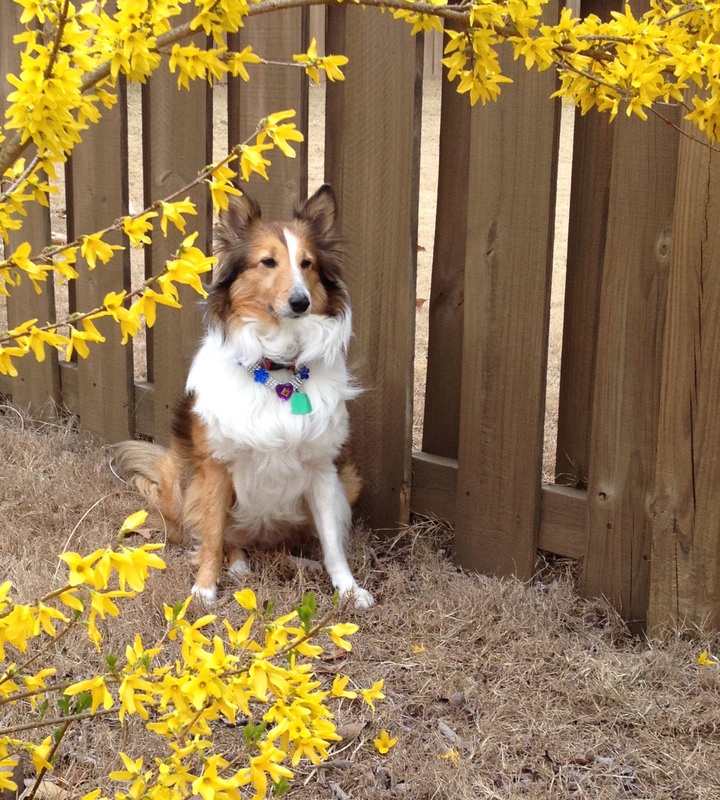 Now that I have a Sheltie, my collection of resources has grown significantly. 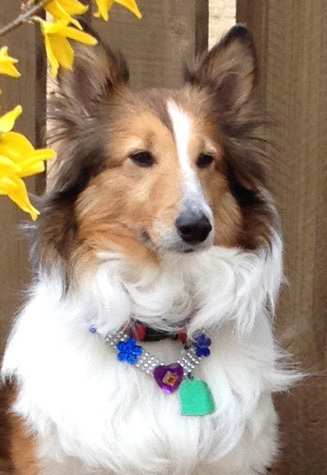 Being the research geek I am, I’ve collected just about every reference available related to Shelties plus books, videos, and websites dedicated to dog training and rescue dogs in general. The more I read, the more I realize how much there is to learn and relearn. Every day with Sasha is full of learning moments—some repeats, some new, and some downright unexpected. Take interaction with children, for example. You’ll find plenty of folks who swear Shelties are great with children, including the volunteer who fostered Sasha for a few days. The volunteer assured me Sasha was “good with kids.” That assessment, though, was based on her observations of the dog with a single toddler over a span of a few days. As any researcher knows, it’s not possible to generalize results from a miniscule sample. In simple terms, this means I cannot accurately predict how Sasha will behave when interacting with children. Today’s experience reminded me that while Sasha feels safe with those in her household, she tends to be reserved but polite in public and has limited tolerance when others (of the human or canine variety) venture too close. So we’ll keep working to increase her comfort level with others while being mindful of her need for personal space. When it comes to children, that means taking her near the playground but not letting her be surrounded by overeager little ones. We’ll keep exposing her to different environments with plenty of room for her to move away from others if she needs to. My understanding of the word, is that “socialisation” is a process of exposing the dog to a variety if things and circumstances. 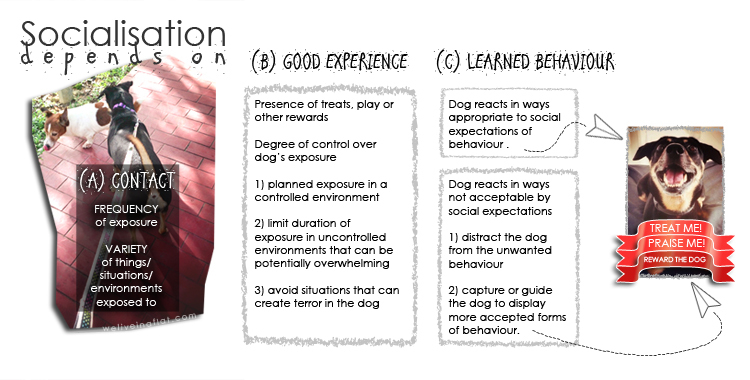 The Socialisation Process can be seen to be beneficial for the dog if the dog displays positive emotions and socially-acceptable behaviour towards what it is being socialised to. You can read the entire 3-part post here. Your own view of the socialization process might vary depending on your personality, your dog, the bond you share, and the environment in which you live. For my part, I want Sasha to learn to be calm, confident, and responsive wherever we are. And that means daily training and time spent in different places with myriad distractions. Every day we both learn something new! We’re also working on the straight sit, something Sasha manages often but not always. The trainer showed us the skip-sit exercise, which involves holding the leash in your right hand and treats in the left, then stepping off with your right foot first and drawing your left foot up in alignment as you stop. By holding the treat at your left side, your dog should line up straight in the heel position. 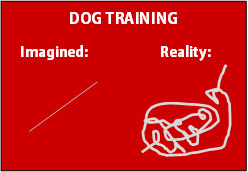 Moving your hand a bit left or right seems to help guide the dog into the desired straight position. We’d be making more progress here if I would remember to step off with my right foot as instructed. My challenge: that contradicts 20+ years of “left foot first” military training! During our training sessions I use Blue Buffalo’s Blue Bits treats because they’re soft, moist, and I can easily break them into tiny bits. She’s partial to the salmon but likes the chicken, turkey, and beef treats, too, so I buy a combo pack. Sasha loves Fromm’s salmon-with-sweet-potato treats at the end of a workout; they’re crunchy and big enough to convince her it’s a well-earned reward. Between six sessions of Basic Obedience, the Intermediate class (four sessions to go), and daily workouts, we go through a lot of treats! Since Sasha doesn’t share my preference for vegetarian fare and prefers the savory meat-flavored treats, our trainer suggested using hot dogs. I’m willing to give it a try if I can find a low-fat, low-calorie hot dog that’s not chock-full of icky artificial stuff. (Is there such a thing?) If making your own hot dog treats sounds like something you want to try, head for the kichen and your oven of choice. Microwave: Start by cutting your hot dogs into small bits. For a dog of Sasha’s size, that might be the size of a nickel cut in half or even smaller. Line a paper plate with paper towels before spreading out the bits. Some folks prefer to cover the bits with another layer of paper towels to help absorb moisture and minimize any mess. Cook times will vary depending on the amount of hot dog pieces and your microwave’s size/power settings; I’ve heard everything from 2 to 10 minutes. Cook until you reach desired crispness. (Sounds like careful monitoring is essential here!) Once prepared, these treats can be stored in an airtight container on the counter, refrigerated, or frozen. Traditional oven: Some folks prefer to bake their treats. If that sounds appealing to you, here’s a video showing you the steps. Note you’ll still need to monitor the time to achieve the desired crispness! Do you have a favorite homemade dog treat? Share in the comments!